provide evidence of your knowledge of German to research institutes and employers. The TestDaF is an advanced-level language exam. It covers levels B2 to C1 on the six-level scale of competence laid down in the Common European Framework of Reference for Languages (CEFR). The certificate issued upon successful completion of all four sections of the TestDaF exam at TestDaF level 4 will act as evidence of the language skills needed to gain admission to almost any subject and degree course at universities and institutions of higher education in Germany. 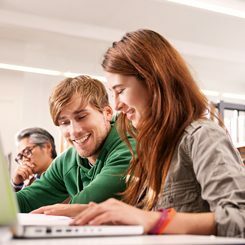 The TestDaF language exam also provides internationally recognized evidence that your knowledge of German is sufficient to complete scientific projects and enter academic professions. No specialist knowledge is required to take the exam. Practise materials and recommended reading are available here.